The golf swing takes less than 3 seconds. The success or failure of the hit is based on the golfers ability to minimize thoughts and to repeat a pattern of motions which are managed from the brain. Practice and repetition seem to be the best process to embed the pattern of a successful swing. GOLFSTR is a golf training aid which will help your mind manage your body. That’s right, high handicappers need to train their mind TO MAKE THEIR BODIES swing like a pro. The difference between a clean hit and a mishit is a fraction of an inch. Professional golfers make consistently better shots than the average golfer because they practice using a technique and motion which they know will create success. Instruction for the proper swing is critical but the straight leading arm is a critical step to consistently hitting the ball straight down the fairway. The key to the perfect point of contact is to ensure that the leading arm is as straight in the back swing as it is at the point of impact. Pros all have different swings but they have one thing in common — a straight leading arm in the back-swing. There are many examples on YouTube.com. High handicappers have a fatal flow. The harder they swing, the greater the back swing and the more the leading arm bends at the elbow. Often the arm never straightens out at the point of impact and the ball is topped or mishit. 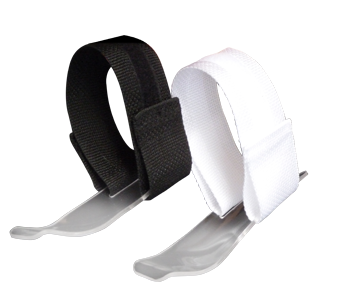 GOLFSTR is a revolutionary solution to understanding the limit of your back swing while maintaining a perfectly straight leading arm. GOLFSTR is a teaching aid for your mind. You can be told a thousand times to keep your leading arm straight but your mind only visualizes golf pros with a big back-swing. That image of wrapping the club behind their neck is forever frozen in your mind. You need to cleanse your mind with a swing that works for your body and your ability. Average golfers may not be as flexible as a low handicap golfer or professional golfer. 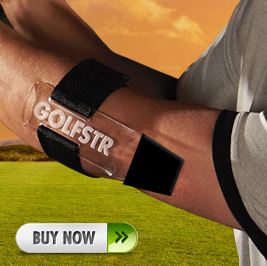 By using GOLFSTR you can first understand that you don’t need the tremendous windup used by the professional golfer. By practicing with the GOLFSTR at the driving range or during rounds of golf you will see the benefits of a straight leading arm and a more consistent impact with the ball. Your mind can be trained to limit your back-swing and to keep a straight leading arm. It works by repetition. When you see how consistently you can hit the ball then your mind goes into automatic pilot. Your subconscious takes over. Your mind will translate SEEING into BELIEVING. Break out of your old habits. Use GOLFSTR and you can train your mind to swing like a pro. A straight arm gives you more leverage and more power without trying to hit harder. Get the feel of the swing. Enjoy the success of your new swing by practicing and playing 18 holes while wearing GOLFSTR. then duplicate your success without wearing GOLFSTR.